Two months into our marriage (9 years ago), I was having some weird things going on with my body and the day they started, my Boss and co-worker said you’re pregnant. Now I had a plan… natural rhythm method for the first year and then we would try to have a baby. Well natural rhythm method was a bust. That night after my co-workers told me I was pregnant I threw the idea to Seth, and in complete denial he said no way and I was over-reacting. So I went to our wedding gifts and grabbed the pregnancy test we were gifted 2 months earlier and said the next morning we would take it. Before Seth could hop in the shower of our tiny one bedroom apartment, I went and took the test and then came out and shut the door stating we needed to wait 3 minutes. My wonderful and impatient new husband waited a minute and said he needed to get going to class. Well….the door slammed and choice words flew! My heart skipped 2 beats and wide eyed I quietly opened the door and peeked for myself-2 lines. I shut the door, gasped and covered my mouth. After Seth’s “verbal” shower, I drove him to school ( last semester) and myself to work not saying a word. Seth finally spoke to me later that night and was not impressed with our birth control method. We did date for 7 years, he was about to graduate in 3 months and so our child-rearing years began. We took a picture of the test and showed it to our families in person within the next few weeks and although they were a bit shocked none of them were surprised. 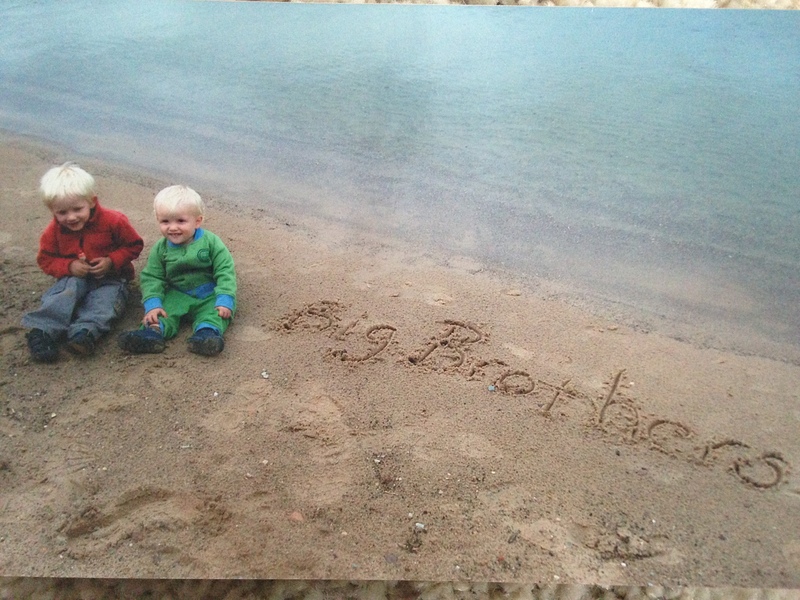 Our little boy was nine months old, we had just bought our first home, Seth was traveling like crazy and opps…. Yet again in between bleaching the walls and painting the new house with my brother-in-law, Brett, I got 2 pink lines! Excitedly I told Brett and couldn’t stop grinning as my plan of 7 kids was becoming a reality. 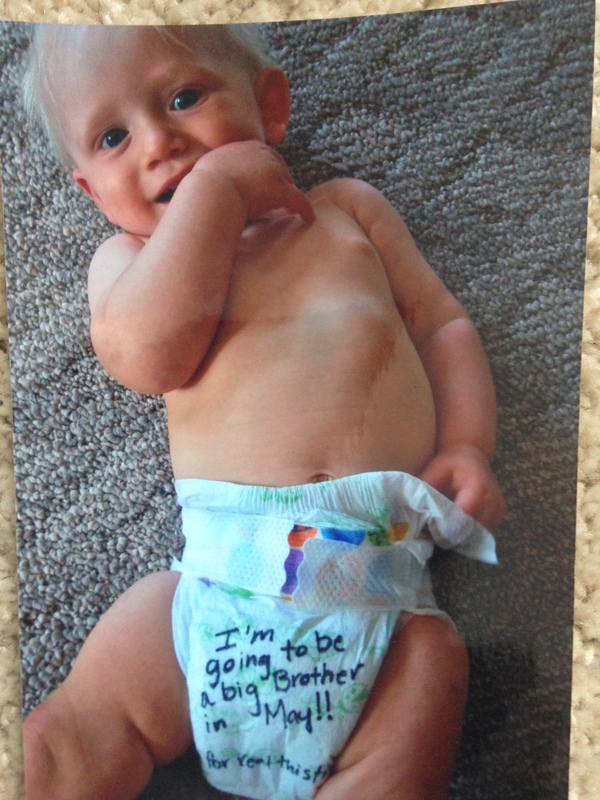 Seth was due to come home after being gone a week that night so I slipped this onto our baby, really…. Our friends, the Hagen’s, were over visiting and they just laughed. Seth’s reaction was “Are you serious?” He is so thankful for me. We emailed the picture to our families that week. This time around we had talked about having another one. Hardy was getting nearing the 18 months mark so we tried and got pregnant. I told Seth the day I took the test. 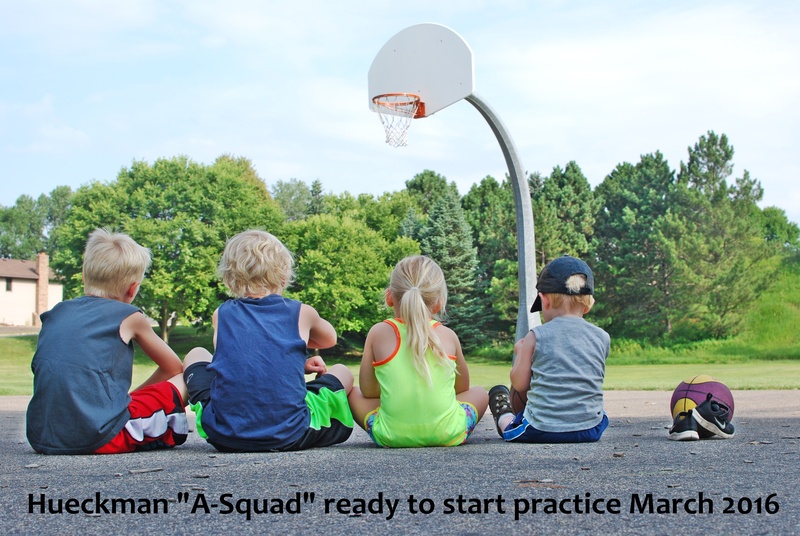 We were headed to Clear Lake ( my favorite camping spot in WI) so I took the boys to the beach for the picture below. We gave it out to our families around my 8-week mark. Unfortunately and for another blog post we couldn’t find a heartbeat at the 12 week appointment. One day we will get to meet that sweetheart in heaven. Since we had miscarried and had the partial-molar pregnancy, we had to wait a few months to try again. After the second month of trying I again saw 2 pink lines and shared the news verbally with Seth. He was not surprised or shocked since we actually were trying. This pregnancy was one we were so thankful for but also very nerve-wracking as visions of another miscarriage kept creeping in my head. My sister-in-law told us they were expecting in the summer and asked me if I had gotten my period. I totally wasn’t keeping track and after a week and her question kept hitting me-I randomly took a test and it too was positive. Now how was I to tell Seth we are having a 4th? 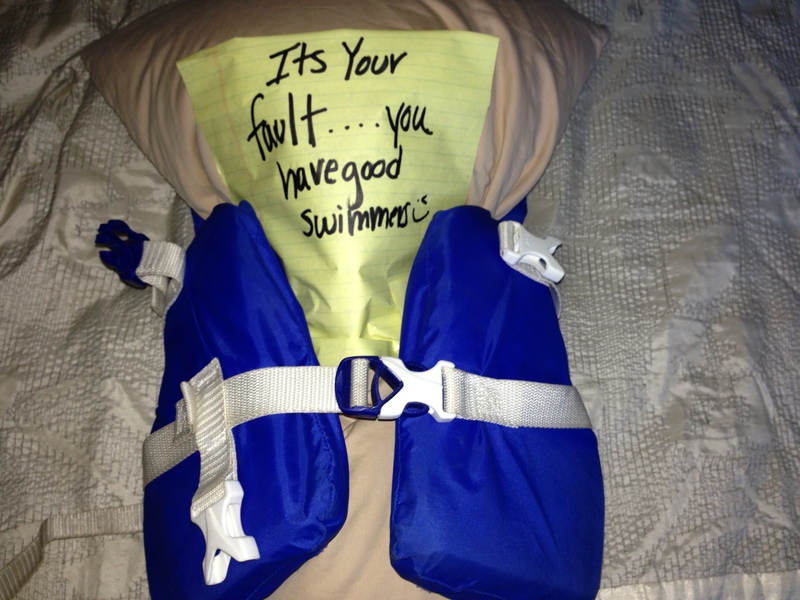 After a few days I saw something similar online so I too wrapped up his pillow in a life-vest and offered to go to bed early that night. I have a video recording of his nervous giggle as he threw off the sheet and said some sarcastic line but it isn’t quite appropriate so ask me in person to show you for a good laugh. We sent the video to some friends and family around Christmas, 2 weeks later. This time was a lot of fun because I feel like we are done. YES- on the record- I, feel like my body, mind and soul are done at 5 kids. Stop laughing and rolling your eyes… I’m serious! So we weren’t , not trying. Low and behold I took another test and it was positive. We had some contractor issues with our house and that week were taking him to court. Not only was I nervous about our court case, I had kept this secret from Seth for almost a week. I took the picture and had it printed and ready to go. After our time in front of the judge we went to the car and were debating to grab some coffee or head back to work etc. Seth said lets take a drive and after the relief of us presenting our case, I said I may have some good news and handed him the picture. He immediately “got” it and smiled. Now he has his full team! 2 weeks later we showed our families. It took some a few minutes to get it but once they did a lot just laughed and shook their heads. So there you have our 6 birth announcements. As I near the end of this pregnancy I’m looking through all my books and notes and thought this would be a fun post. I love seeing and reading about how to tell spouses and family your expecting. Please share your favorite way to tell!